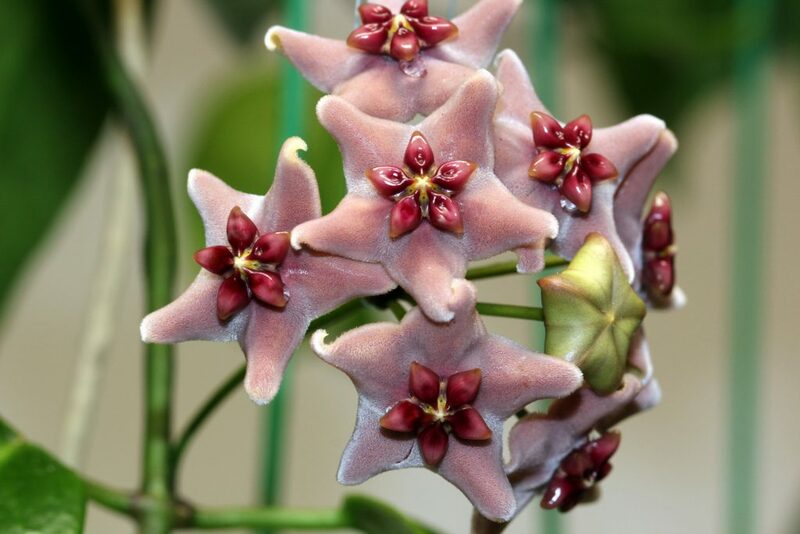 Hoya vitiensis is a very slow grower until it gets established and then can grow very rapidly. It is currently twined around a number of other plants in my grow-tent. The leaves are plain green and measure 3.25 to 4.25 inches (8 to 11 cm) long and are nothing special to look at. The flowers measure about 7/8 inches across (2 cm), and are quite unusual and spectacular. They are covered with very fine purple/gray hairs making the flowers very fuzzy. The corona is yellow with a red center. The tips of the corolla curl back strongly at the tips almost forming a small tube at the ends. The flowers last a very long time; as I write this post, it has been 12 days since the flowers first opened, and they are still going strong. This entry was posted in Hoyas on November 24, 2016 by Doug.